A very special thanks to Jason Adams, one of our patrons who loved the haunt so much he came back a second night for more. If you’re wondering what to expect, his write up paints quite a picture. We love hearing from our patrons, whether they’ve been through the Haunt or enjoyed a play. You’d expect people who do makeup, build sets, make costumes, and act all year round to be able to put on a good haunted house, but this really exceeded anything I anticipated. This haunt is set up with two areas that each have their own theme. Indoors, you have a cursed Egyptian tomb theme, and outdoors you have an urban legends theme. I went Friday at opening, thinking they would have a crowd later, and was wrong, and Heather and I were sandwiched in as part of a constant stream of people. It was enjoyable, but I thought it needed a second viewing so I could pay attention to the details. Saturday night, I lucked into a time where there was a lull in patrons, so I got to go thorough completely alone. Do the second one, fewer people makes for a scarier experience. The inside….they built an Egyptian tomb’s maze of tunnels. And it seriously feels like that, especially doing it solo with no one you can see in front of or behind you (distant screams add to the effect.) Jump scares work on me sometimes, and there are some effective ones that got me both nights, but what I need to feel fear is a sense of dread, disorientation, and isolation. They built a floor into this thing, so in spite of being very familiar with the playhouse’s layout, I had no idea where I was in respect to anything ever, it doesn’t feel like the same building at all. It feels far more like hiking through Carlsbad Caverns than walking through the local playhouse. On the second night, I actually got lost, not realizing that part of the maze changes and you’re supposed to get lost there until later. The set itself has a stunning amount of detail work and little touches, and the pacing is very good too. The use of pitch black here is great, several portions you literally can’t see anything in front of you, and there are lots of places for things to jump out at you, but they don’t use all of them, which keeps you guessing. There’s a lot going in the walls, but there are so many options that you really don’t know where anything might be coming at you from. The outside….again a very creepy, spooky atmosphere, kinda looks like what I’d imagine Leatherface’s back yard looks like, death farm from hell. Lots of creepy stuff out here, and the characters get to interact with you a bit more, quoting lines from the movie they were in, and talking to you directly. It’s unsettling the whole way through, and there is a lot of attention to detail, such as Slenderman’s notes attached to various items, or a book I found called “Tales” that had some freaky looking stuff in it, which I looked at until a polite young lady asked me if she could borrow my eyes to play with because she didn’t have any of her own. Very different from the first haunt, but no less spooky, and more recognizable characters. If this had gone on when I was growing up, I sooooo would have begged my parents to let me participate, it’s pure good times. I really have nothing bad to say here, other than it’s much better with fewer people around you. It’s longer than you think, and the set design is the star of the first, the makeup department and costumes are the star of the second. Throughout, the haunters do their jobs well, and it’s more creative and authentic than someone jumping out and going “Ra” (Get it? Egypt, haha!) The days of blindfolding you, putting your hand into a bowl of grapes and saying “Those are eyeballs!! !” are over. Check this one out. Happy Friday the 13th Playhouse fans! Lots of exciting things happening this weekend. Auditions for the George Cameron Grant play “Heaven Cent” directed by Robert Schumacher will be Saturday and Sunday the 14 & 15 at 7:00 pm at the Western Heritage Museum. Parts available for all ages, the script also specifically calls for a few teenagers! Work continues on the Haunted House which opens next weekend. Look for your BOGO coupon in the Hobbs American Classifieds aka the Thrifty Nickel, the Hobbs News-Sun, or Noticias Del Sol. Coupon is good opening night only (October 20) so grab a friend (or two, or ten), pick up a paper and head on over for a frightfully fun trip to ancient Egypt and beyond! Want to get a jump on the scariest event of the Playhouse season? Get your tickets now for our annual Haunted House!! 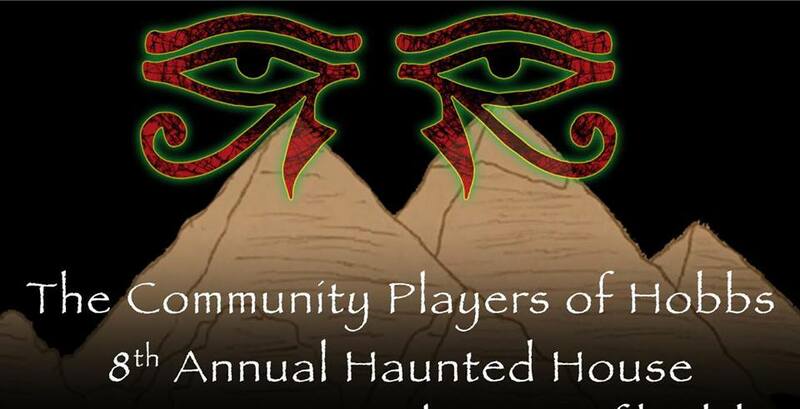 The Community Players of Hobbs presents the 8th annual Haunted House, directed by Nathan Gibbs. The haunt runs October 20, 21, 27, 28, and 31 at 8:00 pm. Tickets are just $10 and include admission to both haunts. Get yours online in advance, print them out or we can scan them from your phone. 1 teenage boy and 1 teenage girl are also needed. Miracles abound on Christmas Eve when the divine intervention of a well-intentioned but hapless angel beings a homeless teenage girl and missionary priest to the same place at the same time. The deadline for submissions for the 2018 season has been extended! Submissions are due Monday, October 9, 2017 by 5:00 pm. 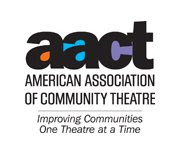 Please submit 3 shows for consideration, with a script and separate cover sheet/submission form for each. The form can be found at either of the links below. You can email your PDF submissions to Leigh Melton at bladez@valornet.com or contact him to make other arrangements. Directors wishing to submit a show must attend the Artistic Board meeting to present their shows and plans for production on Sunday, November 5th at 2:00 at 201 N. Thorp.